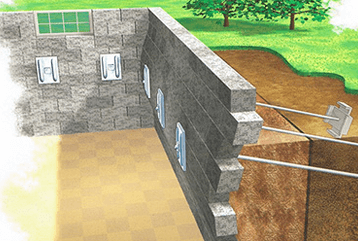 Repairing a home’s foundation will be a top priority after leaks have occurred. Waterproofing will help prevent serious damage, but homeowners must know what works and what doesn’t work. Explore common myths to determine know how to resolve these issues. Filling cracks with an epoxy compound is a standard repair process. Simply filling the cracks without addressing the underlying reasons for the leaks will not stop the moisture problems in the long term. Applying special interior paint to add a layer of waterproofing is another simple fix. Unfortunately, this barrier is typically not strong enough to prevent water seepage from continuing. Some homeowners opt to fill cracks with caulk to keep water from passing through the foundation. After applying the caulk, the crack will usually just reappear larger before beside the original crack to continue the problem. Some contractors will steer homeowners in the direction of complete foundation replacement instead of repair. Replacement is a costly and complicated endeavor. Because aged concrete is actually stronger than new concrete, most homes are better with repairs instead of replacement of the foundation. Structural elements are affordable and effective materials to use for these repairs. Leveling a house with concrete piles is a typical repair for leaks. Unfortunately, continual settling will usually result in the same issues occurring at some point in the future. When leaks are causing water damage, hire a professional for foundation waterproofing repair. Taking these shortcuts or easy fixes will only minimally help, and in many cases, make the problem worse.